"The body's immune system is tasked with recognizing and combating cancer cells, viruses, bacteria and other disease-causing organisms. This defense is carried out mainly by white blood cells and their specific subsets, T-cells, and B-cells, which mediate cell-mediated immune responses and antibody-based immune responses. Professional antigen presenting cells or APCs (including dendritic cells and macrophages) are additional subsets of white blood cells that are critical to the development of specific immune responses. 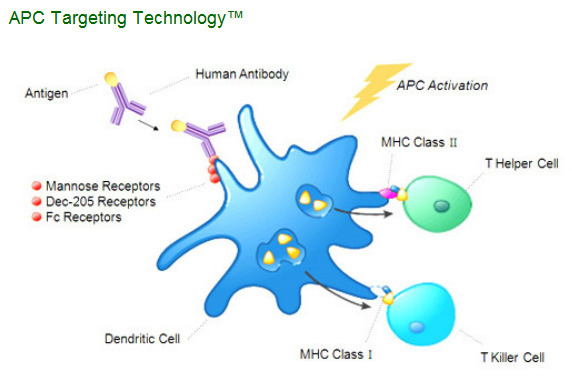 Our APC Targeting Technology™ uses human monoclonal antibodies to deliver a disease target or antigen directly to APCs. Our mAbs are specific for receptors located on the surface of these APCs which are known to be entry portals for antigen processing pathways. In vivo, the antigen attached to the antibody is specifically delivered to the appropriate processing pathways in APCs, particularly dendritic cells (often referred to as "professional" antigen presenting cells). APCs internalize these targeted antigens into specific cellular compartments and then present the processed antigen on the cell surface, thereby initiating the desired immune response." Is it sounds familiar "antigen attached to the antibody is specifically delivered to the appropriate processing pathways in APCs, particularly dendritic cells"? Correct, it's exactly basis of Dendreon technology. But Dendreon does it outside patient body. They need collect patient blood, separate dendritic cells, deliver them to closest DNDN facility, put cells in Antigen delivery cassette and incubate them there, then deliver these cells back to patient and infuse them IV. It's surprisingly that it costs $93,000 for three infusions given over the course of about one month. CLDX attach an antigen to antibodies specific to surface receptors on dendritic cells membranes. And simply inject (IV or SC) these antibodies to patients with this type of cancer (for example prostate cancer). Patient immune system will initiate the desired immune response. Obviously this method is much cheaper than DNDN method. "Preclinical studies have demonstrated that our APC Targeting Technology™ is able to deliver an antigen in a manner that results in significantly more efficient processing and presentation by APCs than a non-targeted antigen (read than Dendreon technology). We believe this creates a more potent immune response than standard sub-unit peptides used in competing immunization strategies. It has been demonstrated in model systems that the antigens delivered by our proprietary monoclonal antibodies are processed and presented by human dendritic cells at least 100 to 1,000 fold more efficiently than a non-targeted antigen. Furthermore, using animal models, we have shown the effectiveness of this strategy in protection against tumor challenges. In addition, using in vitro methods with cells from cancer patients, we have demonstrated that our product candidates can elicit antigen-specific activated T-cells that killed tumor cells expressing the antigen but spared cells lacking the antigen. CD4, or helper T-cells, were also elicited. We believe that activation of these cells are critical for enhancing both humoral and cellular responses, and that these results strongly support our prospects for developing numerous clinical candidates in the coming years." "In addition to APC-targeted immune stimulating products, we are also exploiting our human APC-targeting monoclonal antibody approach to develop therapeutic modalities for delivering antigen-specific immune suppression approaches for autoimmune and allergic diseases. Allergic diseases are a variety of pathologies driven by poorly regulated, Th2 type immune responses to foreign, usually non-infectious, antigenic materials (allergens) in the environment. Autoimmune disease on the other hand involves aberrant immune responses to self antigens. The pioneering experiments of Ralph Steinman, Michel Nussenzweig and colleagues at The Rockefeller University, New York have shown that antigens delivered to dendritic cells (DC) in vivo in the absence of a DC activating stimulus, using antibodies to the DC marker DEC-205, induce antigen-specific tolerance. Using this approach they have also shown that such tolerance induction protocols are effective in models of multiple sclerosis and type I diabetes. Others have also shown that targeting antigens to other APC receptors (e.g. Fc receptors) is also able to induce tolerance. Although our programs for this application of the APC technology are early in development, they may lead to new therapies for a broad range of diseases including rheumatoid arthritis, multiple sclerosis, type I diabetes, systemic lupus erythematosus and major allergies. And MEDAREX INC own 2,960,848 shares (with shares Out. 32.1M). Medarex ( former NASDAQ symbol: MEDX ) is an American biotechnology company owned by Bristol Myers Squibb and based in Princeton, New Jersey. The company has manufacturing facilities in Bloomsbury and Annandale, New Jersey, and research facilities in Milpitas and Sunnyvale, California. Medarex specializes in therapeutic products based on monoclonal antibodies. Thus, CLDX also could be next acquisition target for BMY. Conclusions: I don't have the positions in CLDX, just included it in Hot Watch List with purpose to continuously monitor pps and events. The results of phase II trials will show the potential efficacy of this innovative technology. We will have some news next week. Hope it will be very good news. So, I'm thinking about to buy CLDX. The company will talked about trial "Phase II Study of PF-04948568 (CDX-110) in Patients With Glioblastoma Multiforme (ACT III)"
Celldex Therapeutics, Inc. (NASDAQ: CLDX) will review data on Monday, November 22, 2010 from the rindopepimut (CDX-110) ACT III study that will be presented at the Annual Scientific Meeting of The Society for Neuro-Oncology (SNO) in Montreal, Quebec, Canada. Celldex executives will host a conference call at 8:30 am Eastern Time. Rose Lai, M.D., Assistant Professor of Neurology in the Division of Neuro-Oncology, Department of Neurology, Columbia University Medical Center, will join the call. Dr. Lai is a leading investigator in the ACT III, Phase 2 study of rindopepimut in patients with newly diagnosed glioblastoma multiforme (GBM). <And MEDAREX INC own 2,960,848 shares (with shares Out. 32.1M). nice review of the basic science and for the most part you are spot on! you may want to check the Medarex position which we have discussed numerous times on this board was SOLD around the time BMY bought out Medarex! Marrucci the CEO has confirmed this! I would not wait too long to get your position started as there are still a few hours left today! LOL! Instead of just quoting what Celldex says about their preclinical work with the APC technology, why don't you comment about the Phase I trial results? Did the antibodies actually generate high antigen-specific activated T-cell levels and CD4 levels? How do those early results compare with other vaccines against the same target? Any positive outcomes for the patients? It certainly is. Are you aware that Pfizer after testing CDX-110 in the clinic for GBM and in the lab for other indications decided in September to abandon the vaccine? I think you should say CLDX MIGHT be the next DNDN ... big difference btw approved drug and one that shows good results in P2... I have a lot of share so wish for their success, but lets not confuse a P2 result with no set P3 protocol yet. I am grateful to them for their corrections and comments. Today we have great news! 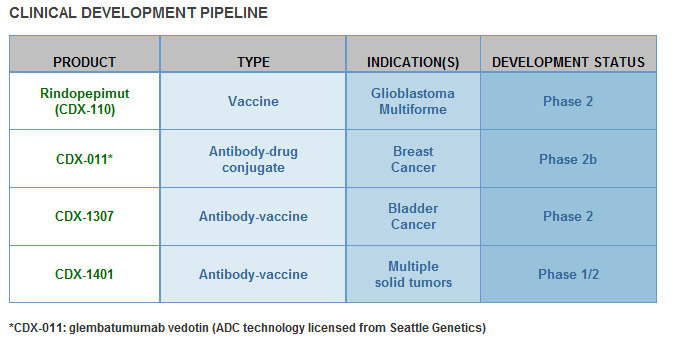 Celldex cancer vaccine meets goal in midstage trial. NEW YORK, Nov 20 (Reuters) - Celldex Therapeutics Inc (CLDX.O) said its experimental vaccine for the the most common type of brain cancer met the main goal of extending survival time for patients without a progression of the disease in a mid-stage trial. The trial, named ACT III, showed 66 percent of patients had no disease progression at 5.5 months from the start of vaccination, a statistically significant increase over a predetermined progression-free rate estimate of 53 percent, with standard of care. The study had 65 patients suffering from newly diagnosed glioblastoma multiforme (GBM) tumors who started vaccination with rindopepimut at about three months post-diagnosis. The vaccine was well-tolerated, with local reactions at the injection site being the most common adverse event. Rindopepimut targets a specific molecule that is only expressed in cancer cells and can directly lead to cancer cell growth. The molecule targeted by the vaccine is usually present in 25-30 percent of GBM tumors, the company said. Celldex's vaccine is similar to Dendreon's (DNDN.O) Provenge, the only FDA-approved cancer vaccine, which treats advanced prostate cancer. Antigenics (AGEN.O) is also developing a cancer vaccine, called Oncophage, for kidney cancer and melanoma. The multi-center Phase 2 trial enrolled 65 patients with newly-diagnosed and optimally resected EGFRvIII-expressing GBM. Patients started vaccination with rindopepimut at approximately 3 months post-diagnosis. The results for the predefined primary endpoint (66% Progression Free Rate or “PFR” at approximately 8.5 months post-diagnosis) show a statistically significant improvement (p=0.0168, 95% CI) over a predetermined estimate of 53%, which is beyond the range of expected progression-free survival for GBM patients receiving standard of care (SOC), consisting of radiation + temozolomide (TMZ). Published results for SOC, and from matched historical controls, are 45% and 29%, respectively, for PFR at 8.5 months post-diagnosis. x Change in median PFS not statistically significant from ACTIVATE and ACT II. * Overall survival data for ACT III are estimated and not yet final. # Sampson, et al. J Clin Oncol. 2010 Nov 1;28(31):4722-9. Historical controls were treated at M.D. Anderson and matched for eligibility (EGFRvIII-positive, KPS ≥ 80%, complete resection, radiation/TMZ and without progression through ~ 3 months post-diagnosis). + Stupp, et al. N Engl J Med 2005;352:987-96. Eighty-two percent of the evaluable vaccinated patients developed a specific anti-EGFRvIII antibody response that was maintained at a significant level in most patients. I think it's very good results. Just compare these results with Provenge (below). It's the goal for cancer immunotherapy is to induce antibody and/or T-lymphocyte immune response targeted to the cancer cells. There are several branches of the immune system that can be targets for immunotherapy. They include antibody producing B-cells, CD8+ cytotoxic T-cells, CD4+ T-helper cells, natural killer (NK) cells, natural killer T (NKT)-cells, and monocytes. B-cells produce antibodies that kill antigen presenting cells via complement, antibody dependent cellular cytotoxicity (ADCC), or apoptosis. Cell mediated response appears to play a major role in a tumor immune response. Many tumors induce a specific cytotoxic T-cell response that recognizes antigens presented by MHC-I, which can elicit a higher response. Dendritic cells are the most potent antigen-presenting cells, capable of presenting antigen to CD8+ (MHC-I restricted) and CD4+ (MHC-II restricted) T-cells. Dendritic cell-based vaccines use a patient’s bone marrow derived antigen presenting cells that are able to sensitize naive T-cells to new antigens. By combining dendritic cells with tumor antigens, the therapy supposes that the dendritic cells will then activate T-cells with tumor antigen. Denedron Corporation has developed Provenge®, a recombinant fusion protein with GM-CSF fused to prostate acid phosphatase (PAP), a prostate specific isozyme of acid phosphatase that is secreted by prostate cells. This strategy uses autologous dendritic cells combined with human GM-CSF. Thirty-one patients with prostate cancer were enrolled in the clinical study and received three monthly infusions and one final boost at 24 months if the disease had not progressed. Results showed 38% of the patients had a T-cell response against native prostate acid phosphatase while some had a decline in their PSA levels. T-cells collected after the treatment revealed the presence of IFN-Ύ, a reflection of successful activation. 82% with Rindopepimut (CDX-110) against 38% with Provenge. "I think you should say CLDX MIGHT be the next DNDN"
Disclosure: I bought 4k of CLDX in 11/18/10 and added 6k in Friday 11/19/10. Also I did some comparison of science basis for CLDX and AGEN that was mentioned as a competitor and rival for CLDX. Today we again have very strange market reaction on good biotech news. CLDX published very good phase II trial results. New CLDX vaccine showed that it prolong survival time for very aggressive brain cancer Glioblastoma Multiforme (GBM). CLDX designed very unique method for targeted delivery of antigens to dendritic cells. In simple words they firstly designed the human monoclonal antibodies that target dendritic cell surface (these antibodies targets Mannose, Dec-205 and Fc receptors on dendritic cell cytoplasm membrane). These antibodies are similar to self-guided missile but they are without any military loads. So, virtually any antigens could be physically linked to antibody’s light chain. It’s again the analogy with self-guided missile that could be loaded by any type of a piece of ordnance. So, CLDX created artificial construct for direct delivery of antigens to dendritic cells inside human body. In the contrary to CLDX Dendreon uses the special “Cassette Technology" to insert a disease-specific target protein into a general platform. Dendreon treatment is very complicate and expensive. First, a patient's own white blood cells, primarily antigen-presenting cells (APCs), are extracted in a leukapheresis procedure. Then, the blood product is incubated with a fusion protein consisting of two parts, the antigen prostatic acid phosphatase (PAP), which is present in most prostate cancer cells, and an immune signaling factor granulocyte-macrophage colony stimulating factor (GM-CSF) that helps the APCs to mature. Finally, the activated blood product is re-infused into the patient to cause an immune response against cancer cells carrying the PAP antigen. CLDX treatment is very simple i.e. three biweekly intradermal injections over four weeks followed by monthly injections until tumor progression. Obviously CLDX treatment is much cheaper and less complicate than DNDN treatment. So, why the market disliked these news? I read some explanations that the results showed by CLDX are only phase II trial results and that is not enough to inspire the market flurry. I just don’t buy it. Look at NBIX chart when this company said that a Phase II Daisy PETAL study using its Gonadotropin-Releasing Hormone receptor antagonist, elagolix, showed "statistically significant and clinically meaningful top-line efficacy results." Neurocrine Biosciences jumped by $1.32, or 48.4%, to $4.05 in the premarket session. Were NBIX results so phenomenal? "The primary endpoint of the study was a reduction in pelvic pain measured using a daily numeric rating scale. Neurocrine considered this endpoint -- suggested by the National Institutes of Health -- to be "exploratory" because the company had never used it before in a clinical trial of endometriosis patients. Patients treated with elagolix reported improved daily pelvic pain scores compared with placebo, but the difference wasn't statistically significant, Neurocrine reported Wednesday. Elagolix also failed to demonstrate benefit over placebo using a daily measure of non-menstrual pelvic pain. The FDA asked the company to include this experimental endpoint in the study." Based on this I can’t said that NBIX had strong results. And it was only phase IIb trial. However, NBIX pps was growing very fast, especially after Abbott Laboratories announced a pact to license elagolix from Neurocrine Biosciences to treat endometriosis-related pain. Abbott will pay $75 million upfront, fund all development activities and make milestone payments of up to $500 million as well as royalty payments on any future product sales of the drug, which has recently completed a Phase IIb study." So, why we have this “anomalous” market reaction on the very good CLDX news? Cui bono? Good for whom? Or it will be better to ask cui malo (bad for whom)? And ask again: cui malo? One more fact about glioblastoma multiforme (GBM) tumor: it's brain tumor and blood-brain barrier (BBB) is separating the circulating blood and cerebrospinal fluid (CSF) in the central nervous system (CNS). Cells of the barrier actively transport metabolic products such as glucose across the barrier with specific proteins. The blood-brain barrier is composed of high-density cells restricting passage of substances from the bloodstream much more than endothelial cells in capillaries elsewhere in the body. Thus, it's not easy even for endogenous antibodies to overcome BBB. Antibodies induced by vaccination should overcome BBB to fight with GBM tumor. On the contrary antibodies to prostate cancer never have this obstacle. So, CLDX choose most difficult kind of cancer to prove their innovative technology. 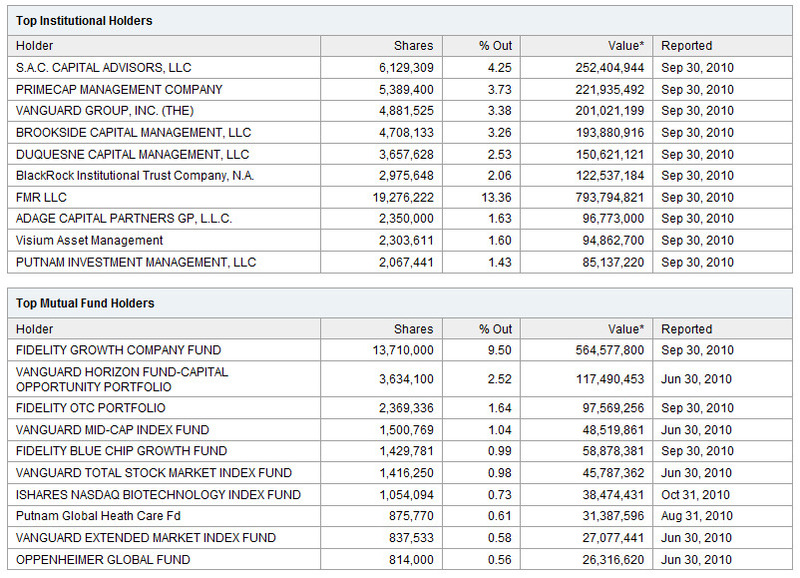 So, funds and institutions are accumulating CLDX and very soon they will have >50% shares. Disclosure: I don't have CLDX positions now. I like CLDX technology but pps $36 is too high for this company - earliest results for lead drug in 2016. I shorted CLDX and will cover below $30.